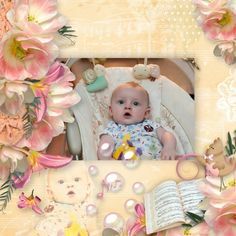 It’s Monday which means I am on the blog to show you some creative layouts I found in the galleries using You Are a Masterpiece by Snickerdoodle Designs. Karen is offering Special Pricing on both the kit and collection in conjunction with this feature. Save now on the “You Are A Masterpiece” Kit and Collection. (Just $4 for the Kit and $6 for the entire Collection!). Don’t miss the opportunity to add the kit or bundle to your scrapping stash at a great price. I really love Karen’s papers and the blended, striped and dotted papers in this kit are just gorgeous. 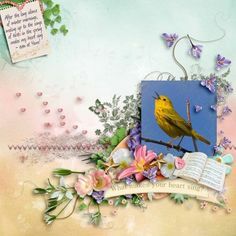 Previously on the blog, Karen introduced her new CT member Heike and showed you a couple of layouts she created using You Are a Masterpiece but I’d like to feature one of her layouts here. Heike is one of my favorite layout artists and she is an expert at blending papers and elements. I think her style might be difficult to duplicate, but the papers in this collection definitely make it easier since some of the blending is already done for you. I really like the additional blending Heike did in this layout and the way she placed the quote included in the kit beneath. What really makes this layout unique is the way she shadowed only a few of the elements. Although the shadows are dramatic, keeping them light in color works perfectly with the soft colors and look of her layout. I really like the offset paper stacking in Adorable by Tracey B. It serves as the perfect foundation for the blended background paper. Tracey also used a template by Heartstrings Scrap Art. The smaller, framed photos placed atop the larger blended photo is an engaging design. The floral clusters are just gorgeous and the word art fits just right for both the theme and design of her layout. I like the way Linda placed the kit word art at the far right of her page. It really walks the eye across the entire layout from the sweet, masked photo to the lovely vertical cluster and finally to the edge of the page. The word art she chose reiterates her theme and I love the way she cut the puzzle piece from her paper to allow the blue to peek through. The layout design in Masterpiece by Chickie works perfectly with the photos of the tulips. I like the way she filled the bottom corner with one photo and placed a larger photo diagonally across but kept it smaller to allow the gorgeous blended paper to show. Her perfectly shadowed flower cluster cascades down one of the blocks while the quote she placed diagonally opposite reinforces her theme. I really like the framing and the way it’s pinned to the page in This Girl by Judith. The vertical strip of torn paper placed behind contrasts with the horizontal stitching across the page. 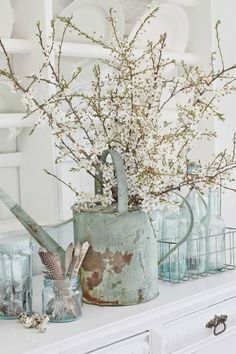 The cluster is so pretty and the paint opposite makes for a well-balanced design. This is a great way to showcase photos from different events. I love the title work. Before I sign-off I want to be certain you didn’t miss the freebie designed by Heike using You Are a Masterpiece. Just click on the image below to download!